Some people think in the shower, others on a long walk. Some like to talk it out with a friend or partner. Some others like to turtle under and not think about things. Me? I iron. Truth be told, I don't like to iron my clothes. My sister and I had this as one of our chores when we were growing up. My mom made us iron all the t-shirts too. Our clothes looked great, even if they smelled like smoke. Now I iron clothes only when necessary. But pressing a quilt top or readying a back for basting is my go-to task when I have something to sort out in my brain. Whether it be bringing swirling ideas together or planning a difficult conversation, the repetitive nature of pressing, with accompanying steam facial is the means by which I can often formulate my thoughts. I've got a lot to sort through this week, anyone want to bring some blocks over? I'd happily send you ALL my pressing if it were feasible. I hate it- and just this past weekend I managed to burn myself nastily trying to reach over my iron. Do you read the Stephanie Plum novels by Janet Evanovich? Her mom irons as a stress relief - Stephanie knows things are bad when mom's ironing at 9am. I like to wash dishes for that reason. Hope you get all the thoughts ironed out. Oh Elsa ( above) if only that worked with aged skin too!! I too love pressing fabric and quilting bits but not clothing. I prewash so I get lots of time to contemplate things while I get to know the fabric. But chain piecing fills the same spot too, for me. I only wish you liked to bind. I'd have a lot for you to do. You could probably figure out world peace before you were done. 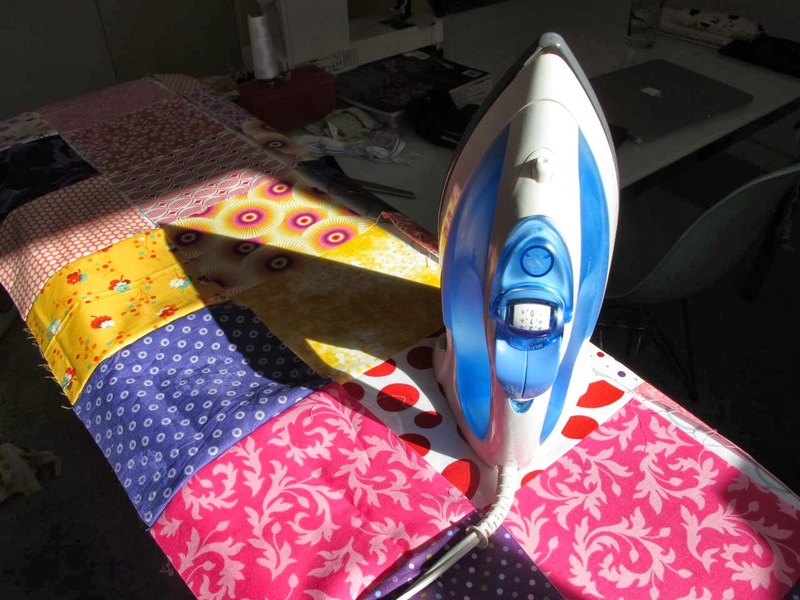 I'm with you - I almost never iron clothes, but find ironing fabric or quilt pieces quite meditative. I thought I was a strange one, but apparently not! I ironed my husband's jeans for work in a factory - he was a line worker. My mom came to visit and found out that he was ironing his jeans again before he went to work. He said I didn't iron them to suit him. He was 6'7" and I didn't stretch the legs enough when I ironed them, so the legs weren't long enough. Guess who went on strike and didn't iron any of his things for a long time? There is also an unfinished quilt from over 25 years ago because of a comment he made about it. And, he is the one who filed for divorce. He couldn't figure out why I didn't want to stay friends. I understand - I think about lots of things when I iron, shower, and drive. I have a quilt back that needs to be ironed, are you game for that? lol Thanks for the post and letting me vent.